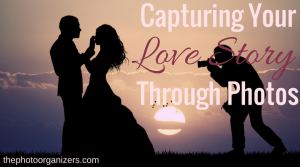 Capture your unique love story this Valentine’s Day with our contribution on The Photo Organizers blog! There are a variety of little details that make up your love story as a couple. Your personal love story is far more than just a formal photo from your wedding day and a few shots on your anniversary. It’s about how you met, the funny moments you’ve shared over the years, the tough stuff, and the beautiful, unique path your lives have taken together.